Bidirection converter for serial and parallel ATA translation. Convert P-IDE (Standard Parallel IDE) to SATA interface and allow you to install the High performance SATA hard disk to your PC. Convert SATA (Serial ATA) to IDE interface and allow you to install the IDE type hard disk to your PC. Serial ATA 1.0 specification compliant. Esay install & no driver needed. Automatic Serial ATA 1.5Gbps speed negotiation. ATA/ATAPI Ultra DMA of transfer rate 16.7,25,33,48,66,100,1300, and 150MB/s. ATA/ATAPI LBA48 addressing mode associated with 2-byte sector count. Provide specified OOB signal detection and transmission. Support spread spectrum clocking to reduece EMI. Provide adjustable TX signal amplitude and pre-emphasis level. Support HDD larger than 240GB. Mini board size, no space wasted. Support Windows 98/98SE/ME/2000/XP/Vista, Mac OS 8.6 and above. 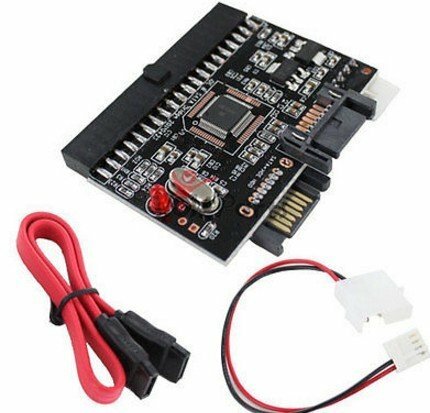 1 x IDE to SATA/SATA to IDE Converter. 1 x 4 Pin Power Cable.